The Segue Source, Segue Partners Newsletter. Spring is in the air and Segue Partners has experienced some phenomenal growth over the past year. Our number of clients blossomed more than 40%, our clients' portfolio companies sprouted 36%, and we continue to grow our staff to meet the needs of our clients. 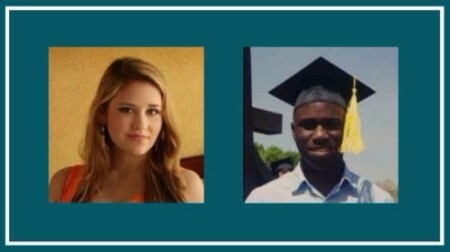 With this rapid growth, we recognize both the need and the opportunity to expand our talented team, so we continue to nurture a strong internship program with resumes for the summer semester from Ole Miss, KU, Rockhurst, Lindenwood, SIUE, and SLU. We are also preparing to take on additional office space that will become available later this year in our current office building. The additional space will allow Segue to continue to provide an environment that allows our team to work efficiently while providing room for team collaboration and client meetings. If Spring fever has you thinking about sprouting a new fund, growing your business, or just cleaning out the clutter, it's time to give us a call. We are committed to providing outstanding accounting and financial consulting services to help private funds manage and grow their funds and start-ups build a strong accounting foundation for success. We look forward to connecting with you to learn what’s new in your business and how we can help! Emily Kuhns, Financial Associate. Emily was hired in January to provide accounting and financial reporting to both our Private Fund and Start-Up clients. She graduated from Saint Louis University with a Bachelor of Science in Accounting and plans to pursue a Master of Accounting degree. 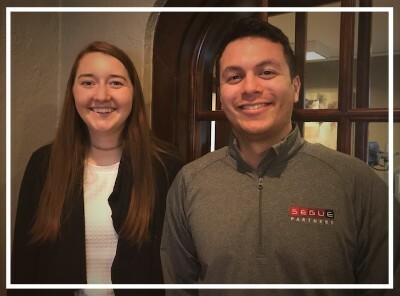 Gary Dias joined Segue Partners as an Accounting Intern in October of 2017 and will begin full-time as a Financial Associate this fall. He graduated from Southern Illinois University, Edwardsville with a Bachelor of Science in Applied Mathematics in 2016 and will earn his Bachelor of Science in Accounting this summer. 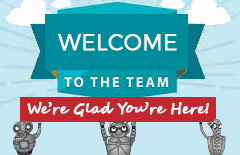 Introducing Segue's Newest Team Members! Hint: this is not a Q&A session and it never goes as planned! We have an impressive group of panelists representing our local Venture Capital community and two rock star CEOs, which have already been very successful at raising angel rounds. You will not want to miss this event! To learn more or to register go to www.mvfstl.org, tickets are only $25 for non-members and free for MVF members. As a sponsor of this year's InvestMidwest Venture Capital Forum, we were thrilled to be a part of this engaging and energetic industry event. The forum featured dozens of early stage companies pitching to venture capital investors and was a great opportunity to showcase emerging companies in the life sciences, technology, and food/agriculture/bioenergy industries. 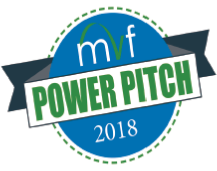 The 2018 conference highlighted all of the start-up and innovation activity occurring in St. Louis, Kansas City and throughout the Midwest. Tax reform poses many challenges for accountants, auditors, and tax preparers as most of the provisions within the Tax Cuts and Jobs Act (TCJA), signed into law December 22nd 2017, are set to go into effect for the 2018 tax year. At Segue, we are currently working with our clients to update their policies and procedures to address the necessary changes. We have highlighted a few of the changes that could affect your fund and portfolio companies below. Previously, taxpayers generally could deduct 50% of expenses for business-related meals and entertainment. The TCJA eliminates the deduction for business-related entertainment expense for amounts incurred or paid after Dec. 31, 2017. It also modifies the rules for deducting meals. Meal expenses incurred while traveling on business are still 50% deductible, however, the 100% deduction for meals provided for convenience of the employer has been reduced to 50% and will be nondeductible after 2025. Employers need to understand their M&E expenses to ensure they are properly categorized and deducted. The TCJA now imposes a three-year holding period requirement in order for capital gains to be realized with respect to a profits interest in an investment partnership (e.g., carried interests) to be taxed as long-term capital gain. Previously, the holding period was one year. If the three-year holding requirement is not met, any gain on the sale of such an interest will be treated as short-term capital gain and taxed at ordinary income rates. Private funds should pay particular attention to the manner in which add-on investments are made by their portfolio companies to ensure, to the extent possible, that they do not lose the benefit of a historic holding period with respect to such investments. Certain add-on investments may result in a new holding period that would implicate the application of this rule. The Act also suspends the deductibility of certain "investment expenses" formerly deductible as miscellaneous itemized expenses (subject to a 2% adjusted gross income floor). Through 2025, a non-corporate partner will be unable to deduct their share of management fees paid to a manager by a partnership. 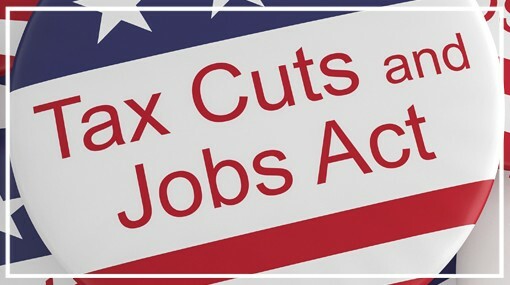 To review the full Tax Cuts and Jobs Act from the US Government Publishing Office click here. In March of 2018, the Financial Accounting Standards Board (FASB) approved the Accounting Standards Update No. 2018-03 which is designed to improve the recognition and measurement of financial instruments through targeted changes to existing GAAP. This will impact the accounting for equity investments, financial liabilities under the fair value option, and the presentation and disclosure requirements for financial instruments. To review the FASB Accounting Standards Update click here. What was standard practice in general business deductions, deal structuring, buying/selling investments, and fair value has changed for 2018 and beyond. Fund managers need to be proactive, informed, and flexible as they look to maximize the benefits and minimize the disruptions that these changes provide. There are numerous open questions regarding provisions of the TCJA and the Accounting Standards Update. While we expect some clarification, it will take time to resolve all open issues. You will need to work closely with your accounting staff or provider to be prepared to meet the new requirements, and as always, Segue Partners welcomes the opportunity to discuss how we can assist with your accounting challenges to help you better manage and grow your fund. Please note that this article is not intended to be an all-inclusive list of tax or GAAP reform items. to make smart accounting decisions. Contact us today for your free confidential consultation. We are only a phone call, e-mail or Skype away! Copyright © *2018 Segue Partners*, All rights reserved. We send special offers to our clients, business associates and friends.